PALO ALTO, Calif., Jun. 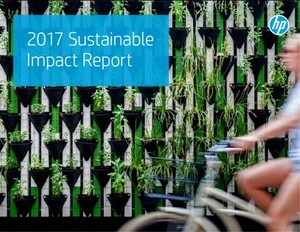 19 /CSRwire/ - HP Inc. (NYSE: HPQ) today released its 2017 Sustainable Impact Report, documenting annual progress and outlining new efforts to drive lasting improvements to the planet, people and communities where the company operates. HP also announced a nearly 8% increase in diversity hires* as well as continued increase of women in senior positions. See the full report at www.hp.com/sustainableimpact. “At HP we’re reinventing for a better world. At the heart of our reinvention is the need to create a business that can have a lasting sustainable impact on the world,” said Dion Weisler, President & Chief Executive Officer, HP Inc. “This is not just the right thing to do, it fuels our innovation, our growth, and creates a stronger and healthier company for the long term.” HP’s 2017 Sustainable Impact Report shares specific details surrounding its progress on goals announced last year as well as key initiatives and updates across the company that impact Planet, People and Community – ranging from advancing a more efficient, circular and low-carbon economy, workforce skills and well-being, and a sustainable 4th Industrial Revolution, to delivering more inclusive, equitable, tech-enabled learning. HP set ambitious GHG emissions reduction goals across its value chain—operations, products and supply chain. In 2017, HP’s Scope 1, 2 and 3 goals were validated by the Science Based Targets initiative (SBTi). Since 2015, the company has decreased its Scope 1 and Scope 2 GHG emissions from global operations by 35% compared to 2015, exceeding its 2025 goal of a 25% reduction. The reductions came through a combination of energy efficiency efforts, and purchase of renewable energy and renewable energy certificates (RECs) in the United States – in 2017, HP reached its goal to use 40% renewable electricity in its global operations. The company also reduced the GHG emissions intensity of its product portfolio by 33%, exceeding its goal of a 25% reduction by 2020 (from 2010) and helped suppliers avoid 1.05 million tonnes of CO2e emissions since 2010. HP’s commitment to transforming the business model for a more materials-efficient, circular and low carboneconomy spans across and beyond the value chain, from sourcing practices and operational excellence, to how the company designs, manufactures, uses and recovers leading products and solutions. HP is working to extend the life of its hardware, and in 2017, 4.6 million units of hardware were repaired through the company’s remanufacturing program. When products reach their end-of-service, HP provides comprehensive repair, reuse and recycling programs. Since the beginning of 2016, HP recycled more than 271,400 tonnes of hardware and is committed to achieving a volume of 1.2 million tonnes by 2025. HP deepened its commitment to transparency by publicly disclosing the names and locations of its recycling vendors in early 2017. Core to HP’s innovation strategy is a groundbreaking closed-loop recycling program, which pioneered the use of recycled plastic from its ink cartridges to make new products. In 2017, the company expanded closed-loop production to printers, with computers next in line for the switch to closed-loop manufacturing. HP partners with Los Angeles-based Homeboy Electronics Recycling to recover material from end-ofservice devices for incorporation into its closed-loop materials stream. By employing formerly incarcerated and otherwise hard-to-employ men and women and training them to repair and recycle electronic equipment, Homeboy is building a world in which our human and natural resources are valued. HP is also focused on driving greater sustainability and opportunity through the 4th Industrial Revolution by using 3D printing technology to deliver on-demand, localized production. The company demonstrated the potential impact by using HP Multi Jet Fusion technology in the HP Latex printer to replace an aluminum part with a redesigned 3D printed nylon part. The change decreased weight of the part by 93%, reduced GHG emissions by 95%, and cut costs by 50%. HP Inc. is one of the top tech companies with women and underrepresented minorities in executive positions. Since the Hewlett-Packard separation in 2015, HP has seen a 6.5% increase in women in leadership – from 21.7% in 2015 to 28.2% in 2017. HP’s executive leadership team is 21% underrepresented minorities, representing seven different countries – putting HP in a strong place to grow diversity in the company. In many global functions including Legal, Finance, HR and Marketing, women represent more than 52% of the employee base. Through a variety of initiatives, including its Global Diversity Advisory Board, strategic partnerships, scholarship endowments, and employee volunteer efforts like the Hour of Code, HP has for years invested in the growth of the STEM talent pipeline, working to advance the cause of equal opportunity for women and underrepresented groups. As part of its commitment to grow the pipeline for hiring diverse talent, HP continues to support programs and organizations like Black Girls Code, an organization providing year-round workshops and summer coding camps, serving over 500 girls in 13 U.S. cities. The camps and workshops are an opportunity for girls from underrepresented communities to learn about computer science and coding principles in the company of other girls like themselves and with mentorship from female role models to whom they can relate. Education opens doors to transformative opportunity and improves the lives of people and communities worldwide. HP made strong progress toward its goal to enable better learning outcomes for 100 million people by 2025. Through 2017, more than 14.5 million students and adult learners have benefited from HP’s education programs (from 2015). This includes nearly 4,000 Syrian refugee students in the first year of HP’s partnership with the Clooney Foundation for Justice and UNICEF; 55,000 new students enrolled in HP LIFE business and IT skills training and more than 4,000 people reached through HP’s World on Wheels program, serving villages and towns in rural India. In 2017, HP also collaborated with the UN Refugee Agency and other partners to launch the first two of six HP Learning Studios in Jordan’s Azraq refugee camp. The report also points to initiatives like HP Classroom of the Future and Campus of the Future, which work with K-12 and higher education institutions to co-create next-generation academic environments. HP’s Applied Research Network is a collaboration with more than 20 higher education institutions to investigate the application of immersive virtual and augmented reality technologies in the classroom. We aim to drive lasting improvements for the planet, people and communities. We engineer with integrity, ensuring all products and operations are based on the highest ethical standards. We are committed to full circle innovation that improves performance, reduces waste, and powers a circular and low carbon economy. And we inspire impact, creating opportunities and enabling action to achieve a more just, equitable and inclusive society. To learn more about these efforts, visit the HP Sustainable Impact website, and be sure to check out the newly released HP 2017 Sustainable Impact Report.